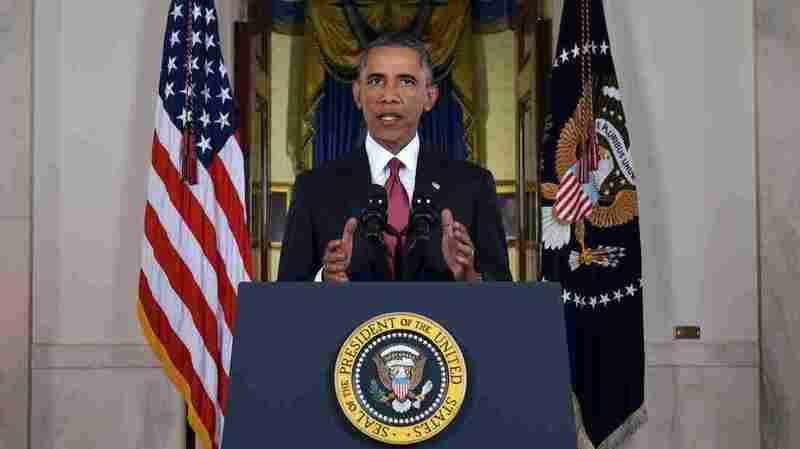 Transcript: President Obama On How U.S. Will Address Islamic State The president delivered a prime-time televised address to the American people on his efforts to go after the group in Iraq and Syria. President Obama delivers a prime-time address from the White House on Wednesday about his plan for fighting the Islamic State. My fellow Americans — tonight, I want to speak to you about what the United States will do with our friends and allies to degrade and ultimately destroy the terrorist group known as ISIL. Still, we continue to face a terrorist threat. We cannot erase every trace of evil from the world, and small groups of killers have the capacity to do great harm. That was the case before 9/11, and that remains true today. That's why we must remain vigilant as threats emerge. At this moment, the greatest threats come from the Middle East and North Africa, where radical groups exploit grievances for their own gain. And one of those groups is ISIL — which calls itself the "Islamic State." 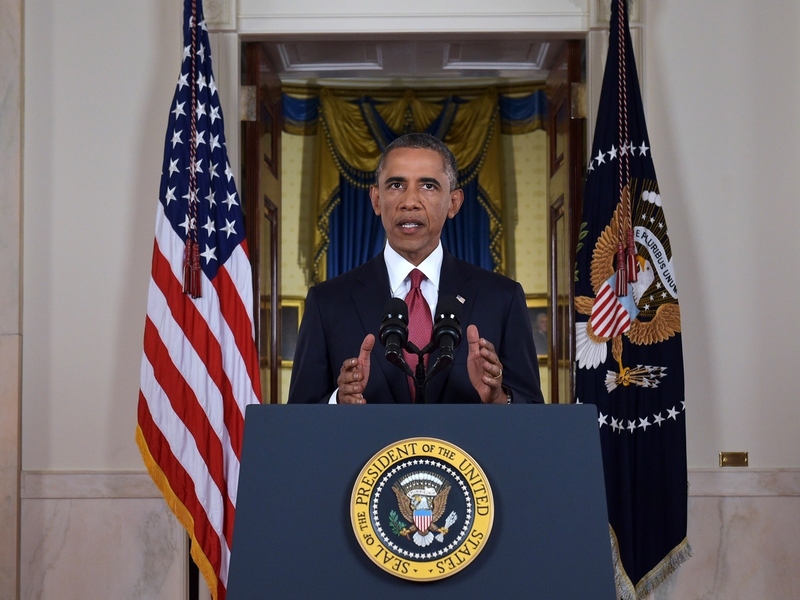 Now let's make two things clear: ISIL is not "Islamic." No religion condones the killing of innocents, and the vast majority of ISIL's victims have been Muslim. And ISIL is certainly not a state. It was formerly al-Qaeda's affiliate in Iraq, and has taken advantage of sectarian strife and Syria's civil war to gain territory on both sides of the Iraq-Syrian border. It is recognized by no government, nor the people it subjugates. ISIL is a terrorist organization, pure and simple. And it has no vision other than the slaughter of all who stand in its way. Second, we will increase our support to forces fighting these terrorists on the ground. In June, I deployed several hundred American service members to Iraq to assess how we can best support Iraqi Security Forces. Now that those teams have completed their work — and Iraq has formed a government — we will send an additional 475 service members to Iraq. As I have said before, these American forces will not have a combat mission — we will not get dragged into another ground war in Iraq. But they are needed to support Iraqi and Kurdish forces with training, intelligence and equipment. We will also support Iraq's efforts to stand up National Guard Units to help Sunni communities secure their own freedom from ISIL control. Now, it will take time to eradicate a cancer like ISIL. And any time we take military action, there are risks involved — especially to the servicemen and women who carry out these missions. But I want the American people to understand how this effort will be different from the wars in Iraq and Afghanistan. It will not involve American combat troops fighting on foreign soil. This counter-terrorism campaign will be waged through a steady, relentless effort to take out ISIL wherever they exist, using our air power and our support for partner forces on the ground. This strategy of taking out terrorists who threaten us, while supporting partners on the front lines, is one that we have successfully pursued in Yemen and Somalia for years. And it is consistent with the approach I outlined earlier this year: to use force against anyone who threatens America's core interests, but to mobilize partners wherever possible to address broader challenges to international order. Our technology companies and universities are unmatched; our manufacturing and auto industries are thriving. Energy independence is closer than it's been in decades. For all the work that remains, our businesses are in the longest uninterrupted stretch of job creation in our history. Despite all the divisions and discord within our democracy, I see the grit and determination and common goodness of the American people every single day — and that makes me more confident than ever about our country's future.